Here is my update on the Aboriginal Tour with Willie from Guurrbi Tours I did yesterday. 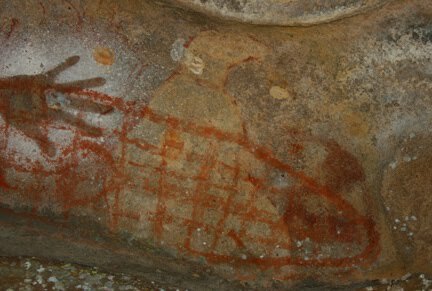 I was picked up at 7.45am and after a 40min drive filled with information we arrived at the area where we started walking through the amazing bush to the areas where the Rock Paintings were located. I was extremely lucky that I was the only person on the tour, that was probably because this time of year is just before the busy season starts. Far North Queensland has a wet season from November to April and then the rest of the year is the dry season which is the tourist season. Willie is one of the nicest and most intelligent people I have ever met, he has an amazing ability of relaying the story of his people with so much passion it can put you in the moment and almost bring you to tears. He had me climbing down through small rock cavities, tasting what crushed ants tasted like, cleaning my hands with leaves and water that foamed like soap when rubbed between your hands and so much more. We went to the cave where the woman would prepare themselves for the birth of their baby and then onto the actual cave where the births took place - his grandfather and father where actually born there. 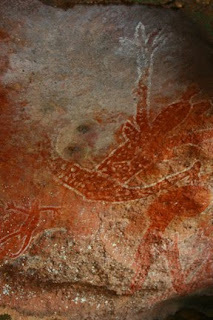 We saw some incredible Rock Paintings - I don't think these photos really give them justice. As Willie teaches - the importance of the paintings is not their age but the story they tell. We saw spectacular scenery, lots of native animals, and I learnt heaps about "bush tucker". Even though we saw so much I think the best part of the tour and the part that had the most effect on me was the way Willie relayed to me the spirituality of the Aboriginal people. I never dreamed that I would be so touched by his stories. I felt so connected to my Mum and Dad during the morning out there in the bush and I felt so connected to nature. Willie dropped me back at my accommodation at 1.30pm and I must admit that even though I had only spent a morning with him it was like saying goodbye to a friend. For about two hours after the tour I was on such a high, excited about the best morning I have ever had. The rest of the day was the most confusing emotional time I have ever had too. It was like someone had put all of my emotions in a jar and shook them up. I couldn’t even explain how I felt and I still can’t. That is why I didn’t update my blog last night, because I just couldn’t do anything. I put myself to bed at 8.30pm and just collapsed straight to sleep. Even though I really can’t explain how I felt I do know I have never felt like that. I was OK when I awoke this morning, but I know that my time with Willie has had an amazing affect on me and has helped me along my “Pilgrimage to Self Discovery”. If anyone out there ever goes to Cooktown I cannot recommend doing a Guurrbi Tour with Willie highly enough. Bottom Painting - Hand & Wrapped for bones of deceased. “Davine Time” update - Spending time with Willie and just being me. Your tour sounds amazing. I don't believe in coincedences myself and from an outsiders perspective, it appears that this meeting with a special person brought you closer to your own feelings and nature. How wonderful for you.